Hey fellas, I'm off for the next few days and despite the buttnumbingly cold weather in New England I'll be working in the shop. Next up is the landing gear bulkheads. I was wondering if anyone remembers about how long the 22 ply (+/- to get 0.25") layup took then. I'm trying to plan around some thing so I can wrap up chapter 4 over the weekend and the hardpoint layup seems like it's going to be the biggest single consumer of my time. Next up is the landing gear bulkheads. I was wondering if anyone remembers about how long the 22 ply (+/- to get 0.25") layup took then. I'm trying to plan around some thing so I can wrap up chapter 4 over the weekend and the hard point layup seems like it's going to be the biggest single consumer of my time. i did the bulkhead ruff layup, the next day i cut the bulk head to shape and added in the hard points and subsequent layups.......i think it was all did in a weekend but if you read it different some where I'll Dennie this post ever happened ! Well, so far I've made really good progress this weekend. I only need to do the 2xBID on the viertical ribs of the IP and glass the front/back faces of the three LG bulkheads. I built up my LG hardpoints yesterday. 22 plies BID and using scrap 1/4" foam as spacers applied a caul plate and weight. The peice came out great except for one minor spot where the thickness is sligtly more than 1/4". Actually it's just less than 1/16" thicker. No much but what this has done though it created a slight ridge betwen the glass and bulkhead foam. I was planning on using flox to smooth the transition over the ridge. Anybody find any problem with that? If so, what would you recommend I do? I'd taper two edges, on one side, of the hardpoints so they end up the same thickness as the foam. 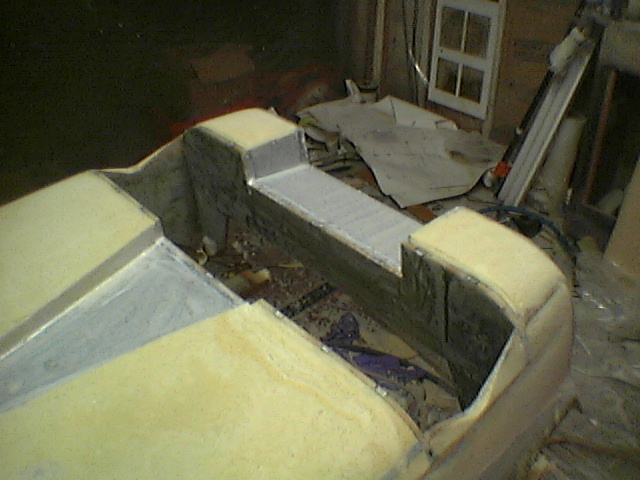 Flox the hardpoint into the foam so that one foam/hardpoint face is flat, this will be the surface that faces into the L/G well. The flat face will be an asset when you add these bulkheads to the tub, as well as when you add the LG (think L/G tab width).